Looking for the healthiest, best tasting water you’ve ever had? 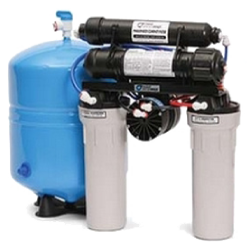 Look no further than our reverse osmosis water systems. This technology removes impurities of all sizes from ions, molecules and larger particles out of your water by using a semipermeable membrane. By removing bacteria, and other impurities, our Reverse Osmosis systems greatly improve taste and texture of the water that you will be drinking and cooking with. Homemade drinks, soups and clear ice cubes have never looked and tasted so good.